I have been eating a lot of Japanese food lately, and I think it's starting to grow on me. Or rather, I'm becoming more open to the possibility of trying new restaurants that serve Japanese food. The latest Japanese eatery I've been to is Zento, in Dempsey. Although the old-fashioned zinc roofing might suggest otherwise, Zento is fairly sleek, contemporary restaurant that serves classic Japanese dishes in a modern setting. Beige upholstery, soft lighting, polished tiles, didn't I say it was a modern setting? I was in two minds about the restaurant's miso soup served in bone china: on the one hand, it is rather more civilised to drink soup with a spoon than it is to slurp it noisily from the bowl; on the other, there is something terribly traditional about black lacquer miso soup bowls, and a jarring cultural incongruity in pairing Chinese and Japanese heritage in this way. Unlike the spider maki I had recently at Kinki, Zento's version boasted a much more generous filling-to-rice ratio: I could taste the crunchy crab, the creamy avocado, and salty tobiko bursting open with each bite, underneath the pillowy sushi rice. Few Japanese meals are complete without a plate of salmon sashimi, with its pale, pink translucence, striated with rippling veins of marbling. With just a touch of dipping sauce, the sashimi melts in your mouth with gossamer smoothness. Happily, the grilled unagi sushi was also delectable, featuring a sizeable portion of eel (relative to the rice), which had a slight nuttiness from the toasted sesame seeds that complemented the glazed sweetness nicely. Zento offers some really attractive set lunches: this combination, for instance, of grilled steak, tempura prawns, vegetables (and dessert) costs a modest $20, and is sufficient to accommodate most appetites. If that's not for you, try a more classic dish, like the oyako-don, which costs only $13. It doesn't look like a lot here, but it was unexpectedly filling: probably due to the richness of the egg-impregnated rice, and the mound of succulent, sliced chicken on top. What is not so traditional at Zento is the dessert, which changes with every set lunch, and tends towards European fare. When I was there, the dessert for the day was a rich chocolate mousse cake, which was outrageously good. Dense and unctuous, with just the right level of sweetness, this was the perfect way to end off the meal - to end off any meal, as a matter of fact. It's difficult to be a truly standout Japanese restaurant in Singapore, but Zento does a fairly good job at trying, with its generous portions, value for money, and mix of classic and contemporary. Everyone flocks to Dempsey for Sunday brunches, bars or European food, but the next time you're there during lunch, think about giving Zento a try! There is a combination of tastes that makes this dish, the smooth fragrance of prawn oil and the sharp, slightly salty crispiness of the sakura ebi. Trawl your local Japanese supermarket for sakura ebi, these can either be found fresh in the sashimi counter, or dried in the dried foods ailse. Sakura ebi is very particular to the Japanese, it is not the same as the Chinese dried shrimp or the Thai dried shrimp (goong hang). There are also different grades of sakura ebi, the more expensive kind being the daintier, pinker and smaller prawn shells. (Hence the name sakura, though the Japanese seem to think everything looks like cherry blossoms). Spread the ebi onto a tray and put it in the oven at 150-180C for 10 minutes to crisp up the prawn shells. Test the shells to make sure they are crackly, if they are, turn off the oven or turn down the oven temperature to 50C to keep the prawns warm. Similar to the previous recipe, boil spaghettini pasta. For this I used Barilla Spaghettini no. 3 but if you wanted a more delicate pasta or if you are serving this as a small appetizer, you can use the finer capellini pasta. Toss the hot pasta in 1/3 cup of prawn oil or cook the pasta in the oil in a broad-based frying pan or wok. If you fry the pasta, you must be prepared to use more oil or fry it with some white wine, as the direct heat will otherwise dry out your pasta. Twirl the pasta onto a plate, or heap it into a bowl, depending on how you are serving it. Toss through with sakura ebi and tobiko roe. The sakura ebi will lose its crispiness when it gets wet so you either eat this dish right away or sprinkle the roe and ebi lightly on small pasta whirls. I also like to serve it with two serving bowls of crispy ebi and diced chives, so that people can ladle it on their pasta when they are ready. For one lunch, we combined the konbu and ebi pasta recipes, which was also well-received but I thought, a slight over-kill. This past week, I've been slightly obsessed with this idea of prawn oil, after tasting a pasta that had been cooked in prawn oil. I decided to embark on an extraction project of my own and researched the topic online. What I discovered was that prawn oil is extracted essentially the same way as prawn stock, by frying prawn heads and shells. Several recipes suggested frying an odori (Italian for "herbs" or "scents") of onion, carrot, celery and thyme and mixing this in with the prawn heads, which is what I did. I only used the prawn shells and heads, freezing the bodies for tempura later in the week. I used one carrot, one large yellow onion and a stalk of celery. Then I added a tablespoon of tomato paste and poured in a litre of good quality extra virgin olive oil. Yes, one litre. (In defense of my prawn oil, it made a large quantity). I let this mixture cook for 1.5-3 hours over a slow and small flame, which preventing the oil from burning but rather, allowed it to absorb all that good prawn stock. At the end of the process, all the ingredients had boiled down to a pulp and I strained out the beautiful, orange-coloured, fragrant prawn oil. I started with a kilogram of raw whole black prawns (about 25 prawns) and ended up with approximately 3.5 cups of prawn oil. 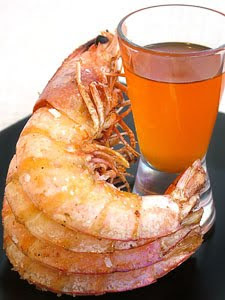 In case you are wondering what prawn oil looks like, this is a picture above. This oil is so versatile, in this recipe, I used it for a cold konbu pasta but you can also use it for sakura ebi pasta (which I'll show next). It can be used for very asian recipes like sar hor fun, or prawn mee, or very western recipes like truffle prawn spaghettini or used as garnish, to give three or four drops of prawn oil in a cauliflower or leek and potato soup. To make the cold konbu (kelp) pasta, pick up some dried or fresh konbu from a Japanese supermarket. Dried sliced konbu is the easiest to find, though I prefer the fresh variety, if you can get it. Sometimes, the konbu is tossed with sesame dressing or seeds (goma konbu), which adds flavour. Cook the required amount of dried pasta, I sometimes use fresh pasta but this time I used Barillo No. 3 Spaghettini. I used 3/4 of a packet with 400g fresh sliced konbu to feed 8 people. When the pasta is ready, plate it and toss the pasta through with the 1/3 cup of prawn oil, konbu, sliced cherry tomatoes, chopped cilantro and sesame seeds (if it's not goma konbu). Refrigerate the pasta for half an hour. This dish can be made ahead of time, in fact, it probably should be, which makes it ideal for entertaining. You must be careful not to overcook the pasta and that the pasta does not dry out in the refrigerator (you may need to add more prawn oil if it does). This pasta won lots of praise and that's unsurprising because it's really refreshing and fragrant, ideal as an appetizer or a light lunch. I finally got some time over the weekend to cook, and I thought I'd stop being lazy and make a hearty, sticks-to-your-sides beef ragu from scratch. Be warned that this recipe should be attempted only if you have a lot of time on your hands, i.e. in excess of 6 hours. The result, however, will be so amazingly tasty that it'll be worth it, and most of the cooking time can be spent out of the kitchen anyway, as the meat cooks on its own. This recipe is adapted from one found in Jamie's Kitchen, and many of the essential ingredients are the same. The philosophy behind this recipe, however, comes from Hugh Fearnley-Whittingstall's excellent The River Cottage Meat Book, which anyone who enjoys cooking and eating meat should read. All good stews start the same way: brown your meats in some olive oil in a large casserole, over medium-high heat, in order to caramelise the flesh of the meat, which will improve both the flavour and the colour of your ragu. Try and brown your meat on all sides, but don't be concerned if it doesn't brown evenly. If you have quite a lot of meat (which you will if you cook using these quantities), brown the meat in batches, removing those that are already seared to a separate plate. If you crowd your pan or pot by cooking too much meat at once, the cooking temperature is lowered dramatically, and you will not be able to sear your meat effectively. Doesn't that look gorgeous? There is something very primitively, viscerally attractive about meat that has been well-browned. Also, the good thing about using ox-tail as a braising meat is that the presence of bones and cartilage fortifies your sauce or stew, adding body, as well as a more robust, masculine flavour. Beef cheeks are also a very good braising meat due to the high collagen content, and the lack of bones, sinew and gristle also means a fairly high return on your initial (fairly modest) outlay. After all your meat has been satisfactorily browned, remove the meat from the pan or pot, and heat up a bit more olive oil. Proceed to brown your onion, garlic, carrots and celery over a medium-low heat. The idea is to caramelise them slightly rather than burn or blacken them, so adjust your heat accordingly. Add your herbs, and cook over low heat for about 5 minutes till the vegetables have softened. Stir the vegetables with a wooden spoon periodically to ensure that they do not burn. Return the meat to the pot, and add the wine, stock and tomatoes (including the juice). If there isn't enough liquid, top it up with more wine or water, till the meat is almost covered or just covered. Bring to the boil, then cover the pot and reduce the heat, till there is only a gentle simmer. At this point, all recipes for slow-cooked meats tell you to put the pot in the oven for about three hours. I have found through experience that this is nowhere near enough, so don't bother with the oven. Leave the pot to simmer gently on a very low heat on the stove, covered, for 4 to 5 hours. Do not worry too much about overcooking your meat, because this is generally impossible. If you have the time to spare, it is highly recommended that this recipe be prepared one day in advance, as that really gives the flvaours a chance to come into their own, in a riotous explosion of taste. Simply take the pot off the stove, let it cool down, and then pop it in the fridge overnight. Once you reheat it back to simmering temperature, you can simply carry on where you left off. After about 4 or 5 hours (depending on the strength of your stove), the braising liquid should have cooked down by about a third or a half, and its colour will have intensified into a rich, ruddy ochre brew that emits heady and intoxicating fumes. Regardless of how voluminous or colourful your braising liquid is, however, the true test is the texture of the meat. Stop cooking only when the meat is fork tender, that is, when the meat fans open into discrete strands when teased with a fork. As you can see, the interior of the meat should still be pink. Using a slotted spoon, remove the meat to a separate bowl or container (reserving the braising liquid in the original pot), and with a pair of forks, tease the meat off the tailbones, shredding the meat into thick strands. It is somewhat heartbreaking to have to do this, and I suppose you could always change your mind and serve an ox-tail stew instead, but sometimes a hand-shredded ox-tail ragu pasta is even more divine. Blend about three quarters of the braising liquid, which should give you a tawny-coloured paste. Strain the remaining one quarter back into the blended paste to thin it out, and discard the pulp that was unable to pass through the strainer. When ready to serve, add the shredded meat to the sauce and warm through, and serve over pasta of your choice (though I recommend something large like pappardelle or rigatoni). If all has gone well, your ragu will not only have an incredible texture from the shredded meat, it will also taste incredible: layers upon layers of flavours all heaped upon one another in a fantastic celebration of sensations. "Where's that?" my father asked me blankly, after I told him that he should drive to Customs House. I had, it seems, mistakenly assumed that Customs House was a well-known landmark like Revenue House or Capitol Building, when in fact, Customs House is an extremely new development near the Marina waterfront. This places it in the enviable position of having the Marina skyline, and the impressive Marina Bay Sands, as its backdrop. Not bad on a cloudless day with an endless blue sky framing the rather picturesque scene. Customs House, however, is a rather inaccessible location, as it presently lacks its own carpark, and since Kinki is on the second floor of the building, I might never have found it, were it not for the rather prominent sign displayed on the ground floor. The restaurant is rather dark on the inside, which allows for some stunning vistas over the bay as you're enjoying your chirashi. Some funky artwork reminds you that you're not in a traditional ramen house. Although there is a sushi counter, where I suspect (but am not sure) you can probably order omakase or be otherwise entertained/enlightened by the sushi chefs, as appears to be the case here. Kinki boasts an impressive sushi menu, with three types of tuna (regular, medium fatty, and fatty), two types of eel (fresh- and saltwater), two types of prawn (regular and sweet prawn), as well as a slew of other exotic seafood. Beyond that, there is also some fairly elaborate sushi which are the unique creations of the restaurant. None of this comes cheap, however; I opted for a fairly simple Spider maki, and even that cost close to $30. I didn't even think the sushi was that good - although the layer of rice was not thick, neither was there a very generous helping of soft shell crab. In fact, in some of the sushi rolls, I could hardly tell that there was any crab at all. Most of the diners that come to Kinki for lunch order set lunches such as the Donburi or sashimi sets, but there are also more meaty offering like the garlic beef set ($28). US prime grade beef is served with crispy fried garlic slices, together with miso soup, salad, and a mochi ball for dessert. My father was instantly dismissive, however, of the fact that the rice used in the set was (what appeared to be) ordinary Thai rice, and not Japanese sushi rice. I decided to have the kurobuta katsu curry set ($22), which came with three medallions of pork, battered, coated with bread crumbs and fried. Again, however, this was served with what looked like Thai rice, and I was surprised to find that the pork medallions were in fact made up of minced pork, making it seem like I was eating a patty rather than a pork loin. I did not regard this usage of minced pork as particularly flattering to the dish: it was rather like eating a deep-fried hamburger patty. While I believe Customs House will be an amazing dining scene in time to come, I do not think that that time has arrived yet. Finding one's way to the place is not exactly simple, and it is extremely easy to overshoot the turning into the One Marina Boulevard carpark (which necessitated us travelling up and down the length of Esplanade Drive and Collyer Quay). The food at Kinki does not, I am afraid, afford much value for money, and while the more classic sushis and sashimis are probably of very high quality, a Japanese restaurant cannot normally survive on sushi alone. It's been a while since I was last at Ember, and on this occasion we were there to celebrate a number of birthdays. I see that not many pictures accompanied my earlier review, so it's fortunate that I took more photos this time. Almost all of us opted to have set dinners, and as the restaurant had only one order of scallops left, we had to choose between two salads. The first was a relatively simply salad of slightly wilted baby spinach leaves, and topped with a generous helping of freshly shaved black truffles. In the middle of the salad lay a coddled egg, which helped to bind the aromatic scent of the truffle within the fibres of its proteins, and, when broken open, also served as a thick dressing for the salad. The other choice was a Japanese-inspired salad very similar to what my sister calls King salad, save that Ember's version was sans tobiko and used mixed salad greens instead of mizuna leaves. On the whole, I think I preferred our version, as the mixed salad greens did not have the unique, mustardy taste or crunch of mizuna. We also managed to snag the last order of scallops, which were wrapped with pancetta and seared to briny sweetness. Fresh and plump, and deliciously paired with crisp salad leaves. Next up was an ebi pasta, where tiny sakura prawns are fried and/or roasted till they are golden and crunchy, and can be devoured whole. I actually think this is a dish which is best enjoyed chilled, for then the rich flavour of the prawn oil is given full opportunity to develop and intensify, so I was not especially enamoured of Ember's warm version, nor did I like the little bits of broccoli that had been added to the pasta, notwithstanding the extra colour they provided. The mushroom soup, however, was extremely salty. When queried about this, the restaurant staff were surprisingly defensive, claiming that it was the result of the reduced chicken stock, and offering us hot water with which to dilute the soup. This may well have been true, but such treatment of customers' complaints is appalling: you might as well just give us mushrooms and ask us to make our own soup. A much more straightforward and palatable approach would have been to take the bowl back to the kitchen and bring out a new bowl of soup, suitably diluted. It always puzzles me why the service industry is so impervious to such common sense solutions. The restaurant returned to form with the main courses though, as my lamb was superb: the meat on the cutlets was exceedingly generous, easily the largest cutlets I've seen recently, and yet was amazingly tender, cooked perfectly, as the rose-blushed hue indicates. The steak also looked rather impressive, though I was not able to sample it for myself. Similarly with the cod, draped with a lush sauce atop a bed of mushrooms. It looked rich and delectably inviting, but unfortunately I didn't try a bite. A grapefruit sorbet followed; sharp, astringent and slightly bitter - all stark tastes to help cleanse the palate and herald the approach of dessert. One (and it does seem like only one person ordered it) of the desserts was a crumble of sorts, which I'm not particularly fond of and so did not try. What I (and, it appears, most of the people at the table) am fond of, however, is warm chocolate cake, and Ember's version is still dependably great. Dark and intense, rich and velvety all at the same time, so maybe it's true that good things come in small packages. Ember has come of age, with all the good and bad that that sort of maturity brings. The food is sophisticated, although with some hits and misses, and service, since it no longer aims to please, can sometimes be a bit rough around the edges. Nonetheless, Ember is soldiering on, and continues to remain a reliable venue for special occasions and date nights, as long as the soup is not too salty. Apologies for the long delays in between posts: I've been swamped with work and am finding it hard difficult to eat out, let alone post reviews. In any event, brunch is fast becoming an increasingly popular phenomenon in Singapore. Perhaps it is the influence of our growing expatriate population, or the fact that the hectic pace of life these days leads to the natural desire to lazily while away a Sunday morning. I've written previously about having brunch at Spruce, and last month I was able to try Jones the Grocer for brunch on a weekday, which is fortunate because the restaurant does not take reservations and it is close to impossible to find a spot on weekends. One of the anchor tenants in Dempsey/Tanglin Village, Jones the Grocer has been there for a number of years now, happily occupying the centre of attention. As its name suggests, you can go to Jones to have lunch and stock up on a week's worth of groceries at the same time. Jones the Grocer specialises in gourmet items such as high-end pastas, cheeses, biscuits and confectionery, oils, sauces, spreads etc. There is an entire case dedicated to chocolate, and you can see that the premium Italian Amedei brand is well-stocked. I don't recall seeing Valrhona, though, so possibly they don't have the distribution licence for it. In addition, Jones the Grocer has a shelf (and accompanying table) full of cookbooks, most of which have been autographed by their famous authors. The collection here is impressive enough to rival most large bookstores, and you'll probably linger here for a bit as you wander around the shelves, picking up books at random and admiring their glossy, tempting pages. Of course, some people do come to Jones for the food too. The centre island serves as coffee station, order station, dessert counter (with psychedelic cupcakes and rich-looking brownies on display) - a very Australian concept which has now been replicated all over. What I was not very pleased with, however, was the service I received. Every once in a while, there will be a letter to the Forum page of the Straits Times complaining about how local Singaporeans are discriminated against in restaurants, and how, in contrast, expatriate diners receive lavish, red carpet treatment. While I think the issue is exaggerated, every once in a while something happens that leaves a bad taste in one's mouth. First, although I informed the waitstaff that I was in something of a hurry, they told me that it was not possible to order anything off the lunch menu before 12 noon (this being around 11.40am). Fair enough, I thought to myself, and waited patiently. At 12 noon sharp, I placed our lunch orders, shortly before an expatriate family sat down at the table beside us. The same waitress who took my order also served the neighbouring family, and wouldn't you know it, not only did their food arrive first, I eventually learned, after waiting half an hour, that she had forgotten to key in my order. Although I was eventually given a free dessert by the manager, it is lapses in service like this that are deeply off-putting. While the oversight may not have been intentional, an unfortunate, nagging doubt is created that we, for some reason, were not worthy of attention. Thankfully, the food arrived eventually, and unpleasant thoughts were put aside in order to concentrate on more important matters: eating. S had a pasta dish, which turned out to be ventagli pasta served with button mushrooms and a chicken ragu. Ventagli is not a pasta you see very often, and it was cooked nicely al dente, its undulating edges helping to catch the scant sauce. I decided to have something equally substantial, as I was somewhat hungry after the wait for the food. My mushroom risotto was a little underdone, as the rice grains were a bit too firm and hadn't yet melded lusciously into each other. Other than that, however, the risotto was fairly enjoyable, and came in a sufficiently sizeable portion that I felt full for quite a while after. Alas, my quest for the perfect chocolate milkshake goes unsatisfied: the offering from Jones was a milky, thin affair, with an obligatory squirt of chocolate sauce. Although topped with a scoop of chocolate ice cream, the ice cream wasn't dark or rich enough, and hadn't been adequately blended into the milk. My lunch at Jones the Grocer was blighted with more misses than hits, and given its mainly expatriate clientele, prices are not exactly low. It seems, therefore, that the cue should be taken from the name: visit for groceries, rather than for a meal.